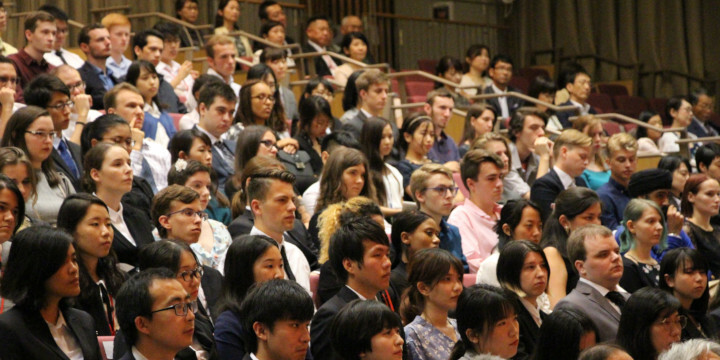 On September 1, Akita International University welcomed a total of 206 new students, including new short-term international students as well as new undergraduate and graduate students, to the AIU family. Since most undergraduate students join AIU in the spring, the fall semester exchange and study abroad students outnumbered the 17 incoming freshman 10-to-1! 19 graduate students made up the remaining new students at the event. Overall, AIU's 182 short-term international students this fall, including 12 in their second semester, make up approximately 20% of the student body. This semester, short-term international students represent 96 universities in 28 countries and regions from around the world. For many new students, the Kanto Team's performance after the matriculation ceremony is their first taste of Akita culture. 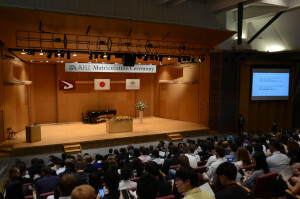 The matriculation ceremony featured welcome addresses from AIU President Norihiko Suzuki and representatives of Akita Prefectural Government as well as speeches by representatives of the undergraduate and graduate incoming class. After a concluding, celebratory musical performance by Select Professor Reiko Watanabe on violin, students were treated to another performance outside the hall, this time by AIU's Kanto Team. The Kanto Team is one of over three dozen clubs at AIU and got a head start on recruiting new members before the Club and Circle Activity Fair later in the day. As classes begin on September 3, international and local students will find themselves fully immersed in the #1 University Environment in Japan, according to Times Higher Education. 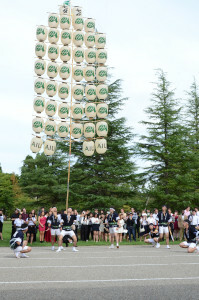 The Environment score, which measures diversity and inclusivity on campus, was one of two categories where AIU finished top among all Japanese universities. AIU also earned top honooors for Engagement, which measure teaching quality, and ranked 12th overall among Japanese universities.